새찬양후원회는 "새 노래로 하나님을 찬양하라"는 말씀에 따라 하나님을 새 찬양으로 찬양하며 또 이를 돕는 모임입니다. 특히 어린이 찬양사역을 중심으로 어릴 때부터 올바른 찬양사역을 받을 수 있도록 돕고 있습니다. 2019 새찬양 축제 NY & NJ 예비 오디션 공고입니다. 봄 새찬양 축제의 오디션이 NY은 3월 16일 토요일 오후 2시에 베이사이드에 위치한 신광교회(33-55 Bell Blvd, Bayside, NY 11355), 그리고 NJ는 3월 23일 토요일 오전 10시에 뉴저지 연합 교회 (147 Tenafly Rd. Englewood, NJ 07631)에서 있습니다. 성악, 피아노, 현과 관악기등이 대상이며 모든 부분에 솔로및 2 명 이상의 합창이나 협주등이 가능합니다. 오디션 참가 곡은 교회 찬송가및 이미 시중에 악보가 출판되어 있는 교회 음악으로 한정합니다. 최종 입상자들은 오는 4월 13일 링컨 센터의 브르너 월터 홀에서 연주하게 되며, 실력에 따라서 최종 1등에게 $1000의 상금이 주어질 수 있습니다. 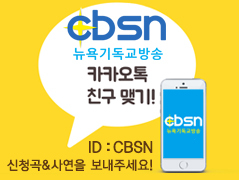 더 자세한 정보는 newpraise.us를 방문하시면 됩니다. 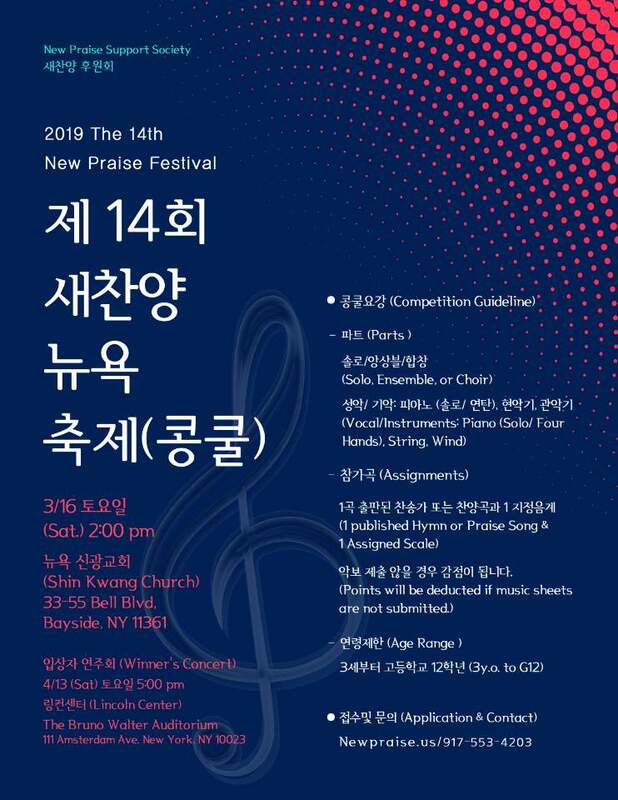 The New Praise Festival will be on Satuday, April 13th at Brunor Walter Auditorium, Lincoln Center. 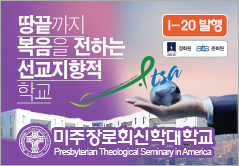 The audition in NYC will be at Shin Kwang Church of NY (33-55 Bell Blvd NY 11355) on Saturday, March 16h at 2 pm. And the Audition in NJ will be at Korean Community Church (147 Tenafly Rd. Englewood, NJ 07631) on Saturday March 23rd at 10 am. We welcome players of Voice, Piano, Strings and Wind Instruments, who are ages of 3 through 17 (Pre-K to 12th G). All parts can be solo and/or ensemble of two or more players. All players of this audition should play one of church hymns or church music, which is already available to the public. The final winner may be awarded $ 1000 depending on the performing quality. For more information, visit newpraise.us.